This post is second in series of Social and Digital Media at the Sarai programme, Centre for the Study of Developing Societies, Delhi made possible by a Social Media Research grant to our senior designer Swati Janu. The research is based on our ongoing project to provide design and technical knowledge to masons and homeowners in informal settlements for construction of houses through the medium of digital technology. The post looks at the daily digital consumption in two Jhuggi Jhopri clusters – Sundernagri in North-East Delhi and Govindpuri in South Delhi. In these settlements, which have over the last few decades gradually gained access to the infrastructural networks of electricity and water supply, digital infrastructures are today fast connecting the communities. 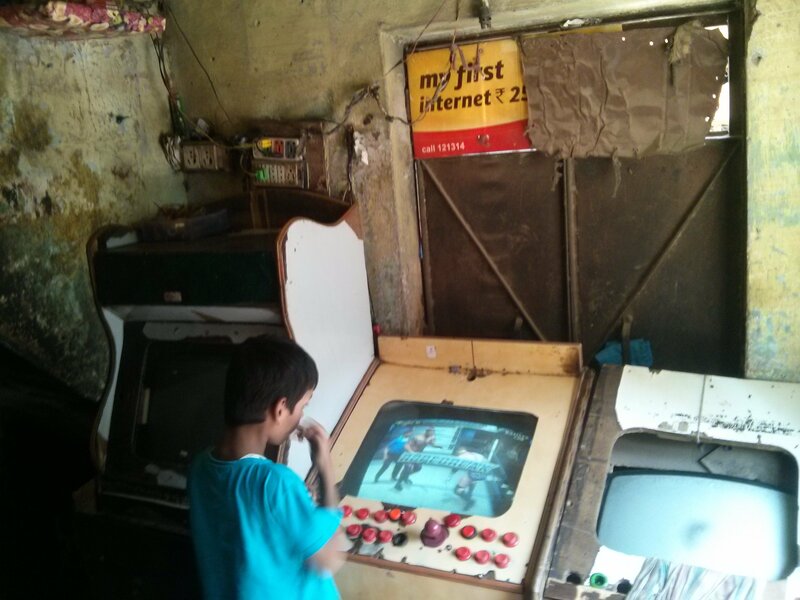 From the more recent networks of phone recharge and media download shops to the older hardware of gaming parlours, the limited supply and storage space of digital technology has created an ingenious network of digital devices and modes here, similar to the creative albeit transitory use of space in informal settlements. My research over the last few weeks has dealt with exploring the networks of digital consumption in two of Delhi’s informal settlements – Govindpuri and Sundernagri. Both are JJ clusters or squatter settlements  that sprang up in the 1970s, along what were then the fringes of the city, around the time of the Emergency  when mass slum clearing operations were undertaken. Personal accounts in my interviews have revealed how the lives of many of the residents there were directly affected by two major projects undertaken by Sanjay Gandhi . The first was the ‘city beautification’ program that led to the eviction of thousands of families in JJ clusters and the second was the ‘population control’ program implemented through mass sterilizations, which were forceful in many cases. Today, both these settlements are dense, bustling neighbourhoods now absorbed in the main fabric of the city, the Govindpuri JJ cluster in South Delhi being more inner city than the Sundernagri JJ cluster in north-east Delhi. Due to its peripheral location, Sundernagri has enjoyed freedom from fear of demolition and houses there can be four to five storeys tall as well as more pakka (permanent) than the two storey plots in Govindpuri. Another advantage has been its location around the resettlement colonies set up there to house those evicted from the Madangir JJ cluster in South Delhi in the 70s. This phenomenon referred to as’slums within slums'often offers protection to squatter settlements from eviction due to their proximity to neighbourhoods resettled by the government and the consequent lowered land value. In both these settlements, which have over the last few decades gradually gained access to the infrastructural networks of electricity and water supply, digital infrastructures are today fast connecting the communities. This post looks at daily digital consumption here – from the more recent networks of phone recharge and media download shops to the older hardware of gaming parlours. The Govindpuri market is a busy one with electric appliances shops and hardware stores to street vendors selling everything from clothes, trinkets, and various plastic products to vegetables, and a full-fledged flea market on Wednesdays. Its main road is always congested with pedestrians jostling with vehicles and hawkers competing with parked cars to claimostling for spahererlours.internet to exisitng to the infrastrucural led by the government and the consequent lowered land vatrying to claimcl their due space. Moving down this road from the tailors and button makers to vendors selling tarpaulin sheets and bamboo, the JJ cluster appears in the backdrop as a monolithic mass making it difficult to differentiate one house from the other. On penetrating it through one of its many inconspicuous entries into its winding lanes, you suddenly find yourself in the cool and quiet of its semi-private and residential spaces. Its bustling streets act as public spaces occupied by kids, the elderly watching over them, teenage boys loitering in groups at the street corners, girls washing utensils or clothes, men and women working out of their homes – everyone in a squatter settlement can be seen making something – from the tailors in Govindpuri to shoe-makers in Sundernagri. After space, water is an important and limited commodity in Govindpuri. Once a day in late afternoons, the neighbourhood is filled with the sounds of gushing water and women congregating over regular banter or occasional quarrels. There is no continuous supply and storage is limited to plastic containers, drums and canisters that can fit within the room sized houses.It is a similar relationship that the community shares with digital media and its storage. Lack of access to uninterrupted supply and limited storage defines the nature of digital networks for entertainment and information here. Mobile phones offer independence, choice and personalised experience of entertainment over televisions today. At the neighbourhood phone recharge shops, movies and songs are available for offline download through the medium of memory cards  in feature phones or smartphones for just Rs 5 to 10. Just as there are community water points shared between a few houses, these phone shops act as digital hubs. This digital consumption is almost daily and storage is transitory with the memory card wiped clean to store new content every few days. Limited resources and lack of access to high-speed internet have created an ingenious digital network in these settlements, the hardware of which exists in the form of cheap OTG  devices less than Rs 100. While offline downloads at phone shops are mostly used by people not digitally skilled, those who use internet on their phones frequent these shops for almost daily pre-paid data recharges. 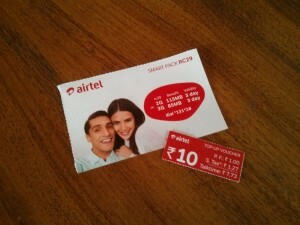 Similar to talk time, small data recharge amounts of Rs 10-30 are most common in both the settlements, either through coupons or direct top-ups by the shop retailer. These top-ups are done either through what is called the ‘flexi’ (or flexible) service where the retailer has a registered account and calls a designated number or more recently through apps such as Pay1. The share of the top-ups is much higher than the sale of paper coupons, offering a 1.5-2% commission to the retailers over the 1% by the latter. Connecting these local retailers are the dealers of various mobile operators who collect payments and distribute coupons to them on a daily basis, covering anywhere from 10-20 shops on foot or motorbikes. Easier payment technologies such as flexi, Android apps, e-pins and net banking have provided a profitable market for recharge retailers, who can now be found at every street corner in most informal settlements in Indian cities. Apart from phone recharges, these local entrepreneurs can be found offering other services from selling groceries and gas cylinder refills to services based on the new payment gateways such as train ticket booking and money transfer. The walkable scale of these settlements further facilitates daily purchases. These small amounts can be seen to be in tandem with the earnings of the daily wage earners, but do not end up being economical in the long run as larger amounts provide more talk time or data proportionally. This transitory consumption can be seen to have its roots in the lack of security (and hence planning) of the status of their dwellings, in settlements such as the Govindpuri JJ cluster which is slated for resettlement. The small recharge amounts play into this insecurity and provide an attractive albeit less economical offer. Larger recharge amounts are purchased by more tech savvy users, most of them youngsters. I found most of the people I interviewed in this group working in clerical jobs such as that of a receptionist or in informal retail such as a fifteen year old I met who goes to school in the morning and sells flowers the rest of the day from C.R. Park. While Facebook and Watsapp are by far the most popular apps online, a few game apps and You Tube are also commonly used. Using internet for browsing and emails is not very common, reserved only those who are digitally adept. In their interviews with teenage boys from a similar context, Rangaswamy & Cutrell observed that many resort to smaller recharge amounts as a way of rationing their usage and curb their almost addiction to internet. An investigation into the physical infrastructure of cyber cafes and gaming parlours led me further towards the offline gaming consumption. While cyber cafes are fast running out of business due to increasing internet usage over mobile phones, gaming culture still thrives today. 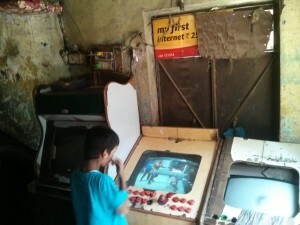 I came across gaming arcades being used from as early on as two decades back at discreet cubby holes in Sundernagri and cyber cafes operating as gaming parlours in Govindpuri. I found this network of dark and shady cramped spaces occupied entirely by hordes of young boys 10-15 years old. They shell out 5Rs for half an hour of usage on an almost daily basis, after school hours, generating daily incomes of Rs 300-350 for the owner. Too young to own phones or dictate choice of content on television at home, these kids resort to arcade games as their digital mode of entertainment. 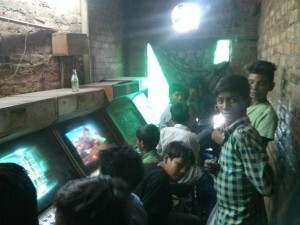 I also met some teenage boys here who have been playing since they were kids and still frequent these parlours despite possessing phones, addicted to the unique playing experience they have grown up on. Unlike the previous two networks, I found no girls at these gaming parlours. There is an illicit and furtive feel to these spaces with their access often screened by curtains and half-drawn shutters. I realized that this might have to do with the kids playing without the knowledge of their parents when I asked them if I could take a picture and one of them made me promise not to put it up on You Tube, lest his mother sees him. Squatter settlements are commonly referred to as slums, defined by UN Habitat as communities characterized by insecure residential status, poor structural quality of housing, overcrowding, and inadequate access to safe water, sanitation, and other infrastructure. More pakka settlements are typically built in concrete frames with brick and mortar infill. Semi-pakka settlements have more of brick structures stacked without mortar, and kachcha or temporary settlements are relatively younger and with more insecure land tenure, typically built in temporary materials most commonly associated with slums such as tarpaulin and tin roofs. Informal settlements in Indian cities are an amalgamation of these categories and range within the formal to informal spectrum based on the land tenancy and tenure. 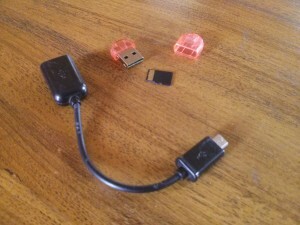 USB On-The-Go, often abbreviated to USB OTG or just OTG, is a specification first used in late 2001 that allows peripheral devices to connect to each other. It allows those devices to switch back and forth between the roles of host and client. For instance, a mobile phone may read from removable media as the host device, but present itself as a USB Mass Storage Device when connected to a host computer. A phone retailer in a squatter settlement may typically hand out recharges of Rs 10,000 daily and so the middle men dealers could be collecting a few lakhs of Rupees daily. See Rangaswamy, N., & Cutrell, E. (2012). Anthropology, Development, and ICTs: Slums, Youth, and the Mobile Internet in Urban India. ICTD, 9 (2), 51-63.